Ok, I know it might seem from my last post that I could not possibly have eaten any more during my short week in Spain. But oh, I did. See, my excuse is that it rained almost every day I was there (I know, I was not expecting this either). 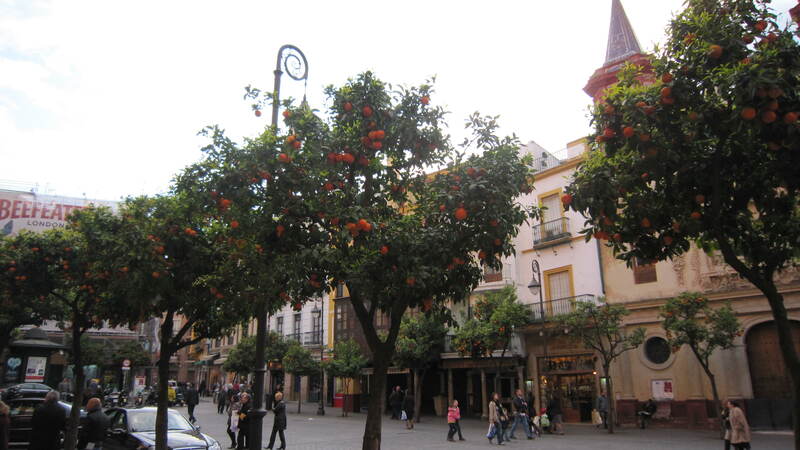 And it turns out there are very few public spaces in southern Spain that are indoors– people tend to congregate in outdoor plazas, and lots of smaller cafes have only outdoor seating. Even a lot of the tourist attractions were outside. So when we wanted to take refuge from the rain (and couldn’t contemplate another tapas), we were obliged to duck into a bar or bakery for an hour or so. We can start with the drinks. 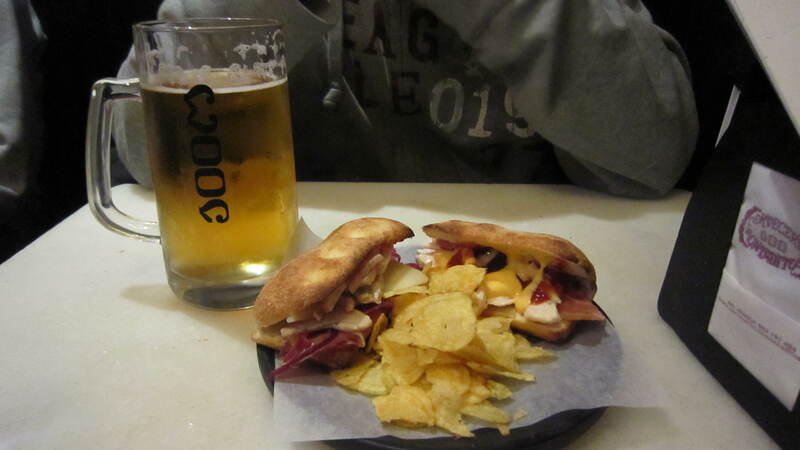 There were two drinks on seemingly every menu in Seville: Cruzcampo beer and tinto de verano. Cruzcampo brewery was founded in Seville, which I guess explains its huge popularity there– it is the only or primary beer in a lot of places. I took one sip of Brett’s, and that was enough for me. I’m not a beer-lover, and it tasted pretty much like Budweiser or something to me– not something I would seek out, though I’m sure some people would like it. 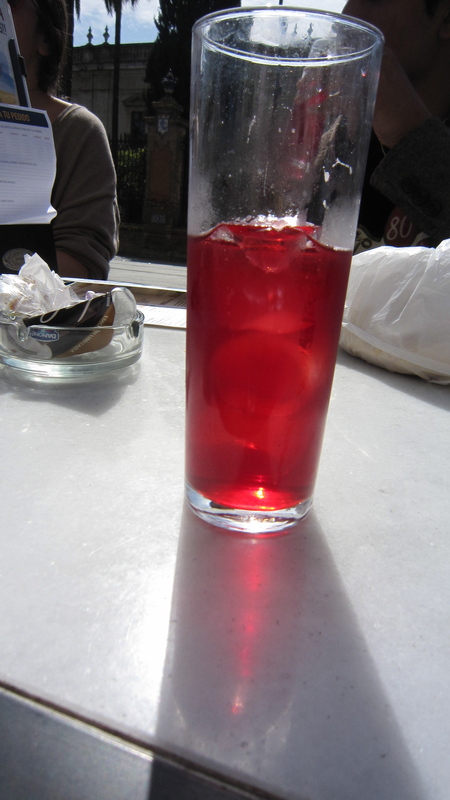 Tinto de verano was much more up my ally. 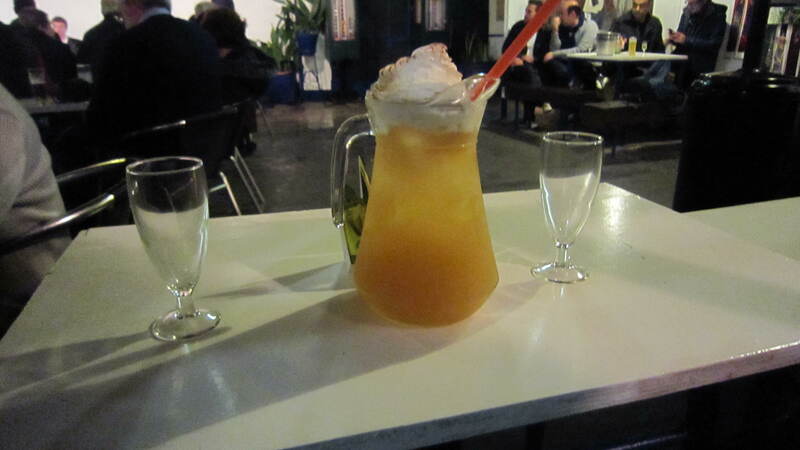 This seems to be the south of Spain’s version of sangria (which I hardly ever saw offered). It’s a mix of red wine and a carbonated lemon-y drink, served cold. It’s very refreshing, and I found it a good drink for those times when we really were just sitting somewhere to take a break, and I didn’t want anything strong. The day that it rained the hardest, by the way, happened to be a Wednesday, which is apparently long-awaited all over Spain due to the deal that a chain called “100 Montaditos” (100 little sandwiches) has. On Wednesdays, all of their sandwiches (which are, as the title implies, little) are 1 euro, and if you buy it with a sandwich a big mug of beer or tinto is only 2 euros. The sandwiches are mediocre, but if you’re getting the ones that are normally 2 euros they’re a pretty good deal, and the place was certainly packed all day long. On the stronger side of things, I was informed by Mother Spice that I had to try sherry while I was in Andalusia, as this fortified wine is only made in the region. This proved a little difficult at first, not because places didn’t carry it, but because I had no idea what it was called in Spanish– it turns out it’s “Jerez,” the name of the area where it is produced. The Spaniard I finally got this out of was completely bewildered as to why we English-speakers would change this to “sherry.” In any case, the sherry I tried was much drier than those I’ve had before, and so could be drunk with a meal rather than as a dessert. It was perhaps not the wisest decision, however, to follow our sherry-tasting with agua de sevilla, but we happened to be going straight from that restaurant to a flamenco show at La Carboneria. This is the venue advertised everywhere as the best for flamenco in Seville, though we actually enjoyed a more amateur show on Calle Betis in Triana even more. Either way, “agua de sevilla” was advertised heavily in La Carboneria, and Brett’s Spanish friend informed us that it was “very local,” and we had to try it. Far from being water, Brett’s report of it being made was “a third champagne, a third pineapple juice, and a third mystery mixture.” A wikipedia search shows that the “mystery mixture” was probably a combination of whiskey and cointreau. In any case, this delicious combination was topped off with whipped cream and cinnamon– and while a whole pitcher may have been slightly ambitious, it was certainly delicious. Thankfully, however, there were some days when our rain-breaks came in the form of baked goods rather than beverages. My favorite of these, hands down, was churros y chocolate. Though fairly common, it took us a little while to find somewhere serving this combination, but it was well worth the wait. 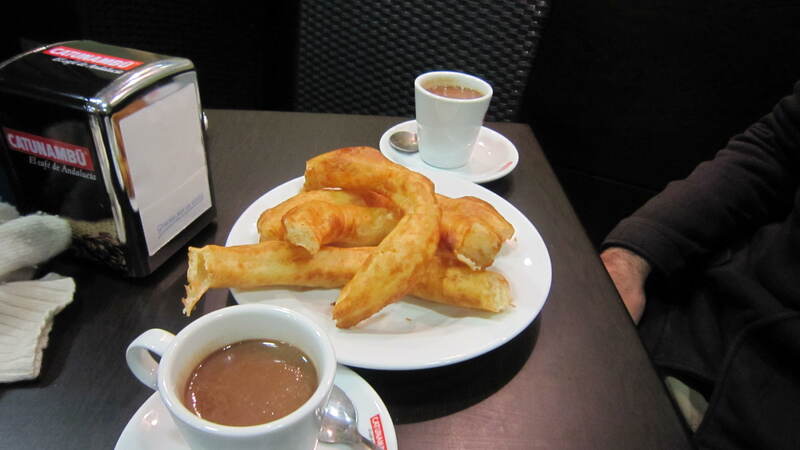 The churros in Spain are not covered in cinnamon sugar, but are simply long pieces of fried dough. 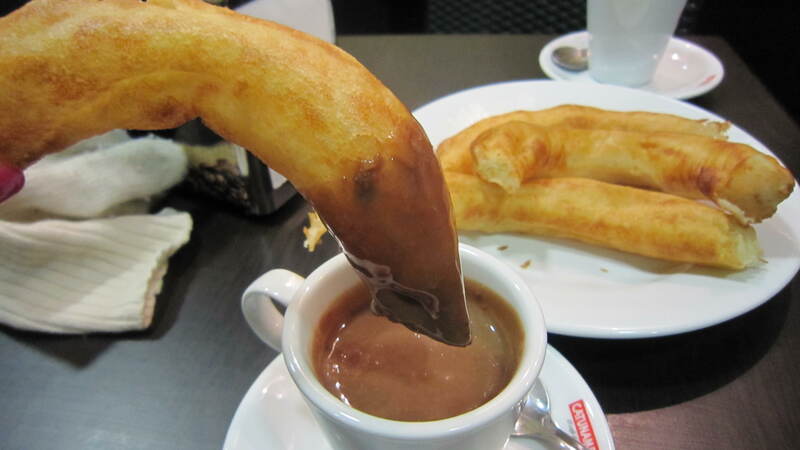 When ordered “y chocolate,” they come with hot chocolate that is intensely rich and thick and, blissfully, you are encouraged to dip your churro into the chocolate. One would be hard pressed to find a better combination. ... and give it a dip! We also tried some other local pastries, many of which were excellent. I unfortunately didn’t catch the name of the honey-soaked flaky pastries in every window, but they were surprisingly good– I thought they would be overly sweet, but they turned out to have a delicate aniseed flavor balancing out the honey. We had intended to search out one of the many convents that apparently sell nun-baked pastries from their windows, but unfortunately in this one mission the rain thwarted us. 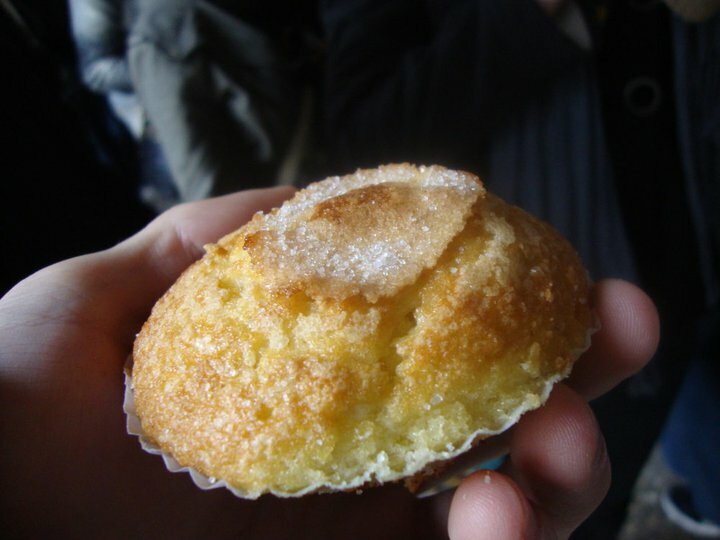 Brett did find them after I left, however, and snapped a picture of their traditional muffins for me. As Roxie told you, I spent my spring break in Spain this past week, visiting my boyfriend, Brett, who is studying abroad in Seville. 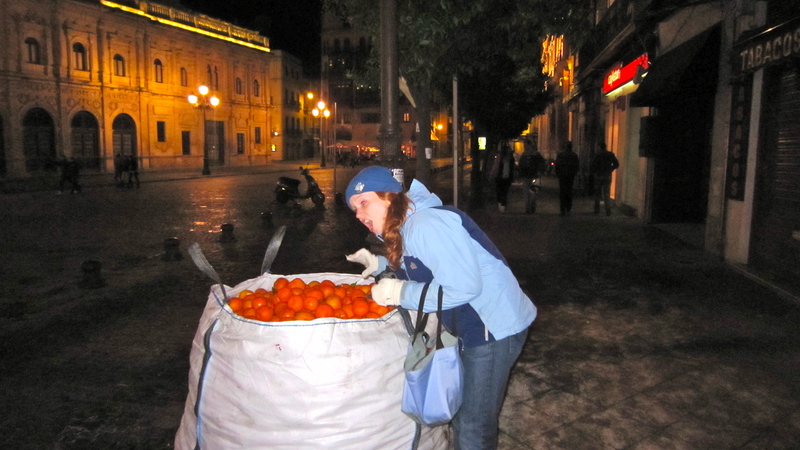 I spent most of my time in Seville, but also managed to get to Cadiz and Cordoba for short trips. And basically, I ate. A lot. Thankfully the tapas culture allowed me to do this, because we could have lunch at one, a tapas at four, a couple more at nine… etc. But at least I had the excuse of having to report back on all the varied dishes for you readers! So this is my attempt to put down the best things I had. In some cases, there were really good restaurants where everything was just amazing. In others, there are local dishes that I’m sure would be excellent no matter where you get them. Let’s start with the most prevalent dish around: Iberican ham (jamon Iberico). 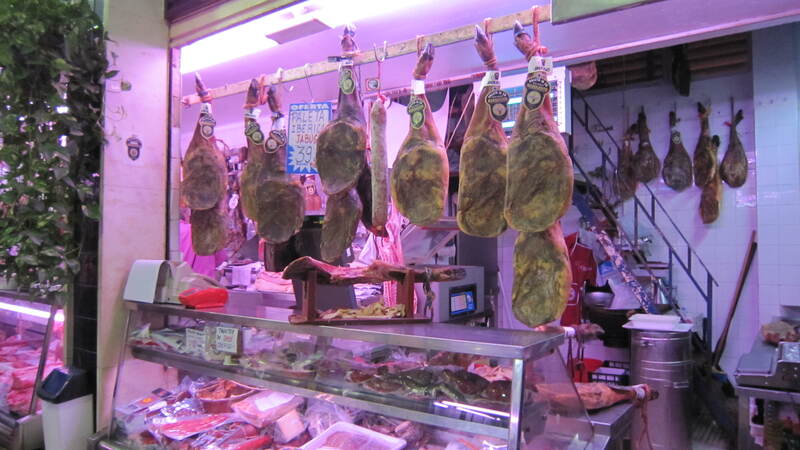 Legs of this cured meat are hanging in absolutely every restaurant in Seville, as well as almost any place you can buy food. The carving of the ham off the leg is apparently a prized art form, and is pretty engrossing to watch. The trick is to get pieces with a good ratio of fat and meat. The ham is delicious, but I have to admit that combined with the many chorizo, prosciutto, and other cured-meat dishes and sandwiches I had, I had basically filled my salty-meat quotient by day three and had to move on to other things. 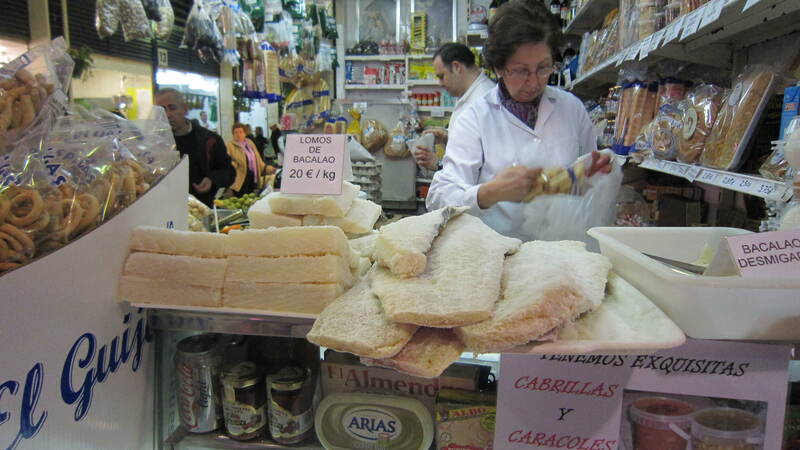 Another big Spanish dish is bacalao, or dried and salted cod. Both times I had this it was battered and fried, and reminded me somewhat of fish sticks… but with an amazing actual-fishy, salty, taste. The balance of flavors was perfect for me, and I couldn’t imagine getting sick of it. 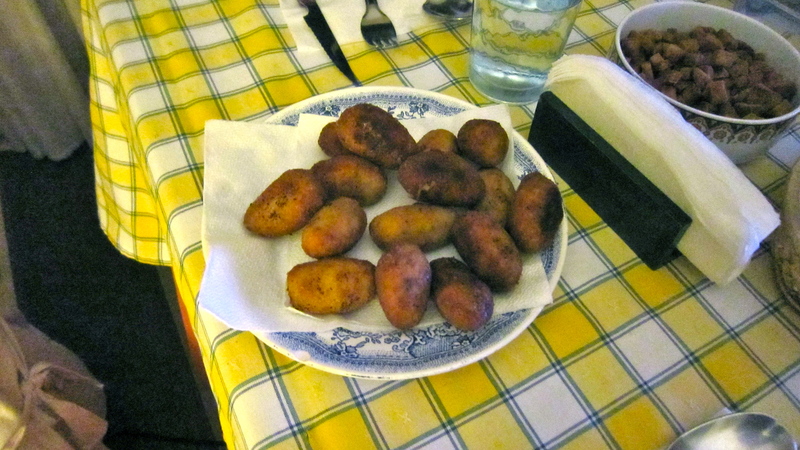 As for other dishes, croquetas are on almost every menu. I most frequently saw spinach ones and ones with various meat fillings… basically the filling is mixed with herbs and lots of delicious things, then shaped into oblong rolls, covered in breadcrumbs and fried in olive oil. The spinach ones at Taberna Coloniales (below) were great, but Brett said he had never had any as good as the ones his host mother makes. I was lucky enough to try these when she invited me over for dinner, and they were absolutely outstanding. She explained to Brett for about five minutes what was in them, but the gist I got was: lots of delicious things, including about three types of meat. I still haven’t figured out how they get so soft and creamy, but hopefully Brett will get the recipe from her some day. She also served us an amazing Spanish tortilla, basically a huge omelet filled with potatoes, but she had also made some delicious garlic-y sauce that oozed out of it. 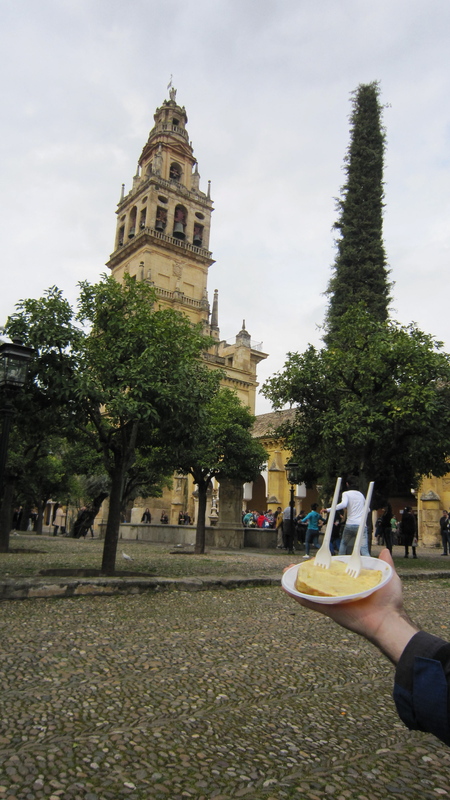 We tried another Spanish tortilla just outside the mosque at Cordoba when we were a bit peckish– we got a huge slice for one euro, but it couldn’t quite live up to Mama’s. We also noticed signs all around Cordoba for snails, which I hadn’t expected in Spain. Brett is apparently a big snails fan, and so when we passed a sign with a picture of a very happy snail saying “Our snails are cute and fat,” he had to go inside. He ordered the snails in a green salsa, and they were indeed the fattest ones I have ever seen. I don’t like snails quite as much as him, so I only had a couple, because honestly the size kind of freaked me out (not like the tiny snails we had in Greece, that you see as the background to this page). I will not deny that they were delicious, though. In addition to these dishes, there were two restaurants we went to in Seville that really stood out to me: Taberna Coloniales and Madraza. We went to Coloniales my first night there, which turned out to be excellent timing… I was tired and hungry, so we got there super early for Spain (around 8:30, I believe). This meant we were seated right away, and actually had to wait ten minutes for the kitchen to open before we could order. I say this is good, because by the time we left there was a huge line waiting to eat… it is clearly a very popular spot, and you can see why, because the food was excellent. Other than the Spinach croquetas mentioned above, my favorite dish was the Pechuga de Pollo con Salsa de Almendras, or chicken breast in a creamy almond sauce. We ordered a medium (rather than tapas) portion because we were sharing with a bunch of people, and it was huge and delicious. The Secreto Iberico was basically a steak of cured, salty, pork, and was also very tasty, but I kept going back to mop up that almond sauce with the french fries that come with everything in Spain. The other stand-out restaurant we went to was on my last night. Madraza has many of the standard Spanish dishes, but also featured some Middle Eastern-inspired dishes, which was a nice change. My favorite was definitely the pollo al jerez, or chicken in a sherry sauce with pine nuts and super-juicy raisins. Again, the sauce was completely addictive. The chicken with coconut curry, while unexpected, was also seriously good. 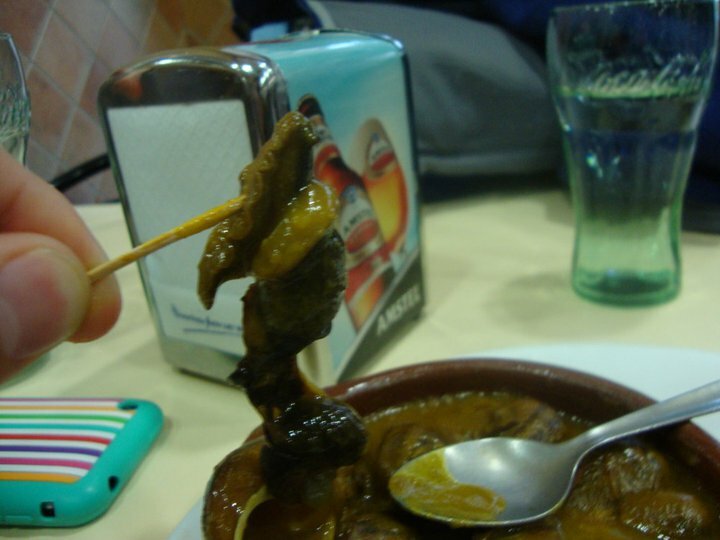 Madraza also demonstrated one of the tricky things about tapas– most of the tapas were around 4 euro, which may seem a little steep when the typical price of a tapas is in the 2-euro range. 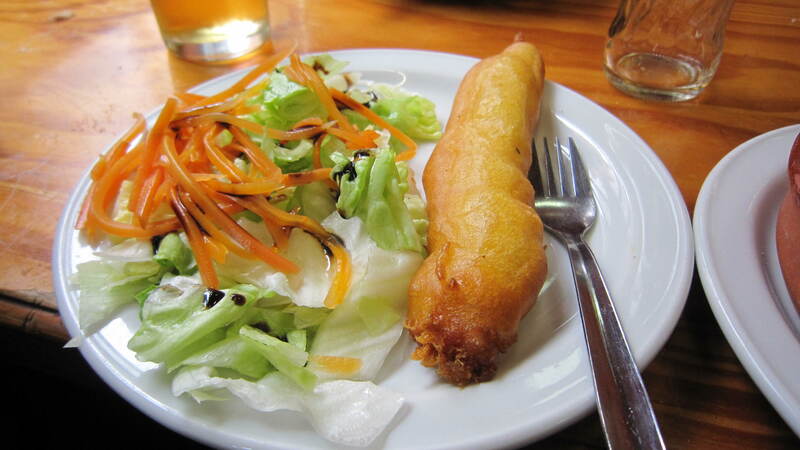 However, tapas portion sizes can vary hugely– here, they were enormous, and we each ordered one and shared them. This meant I had an extremely filling meal and tasted many different dishes for exactly 4 euro. I don’t know if I’ll be able to face the over-priced tapas places in Washington again. So basically, all of the food was incredible, and I may attempt to re-create some of the best dishes in the next few months. But for now, look out for a post on desserts and drinks in Spain, coming soon!